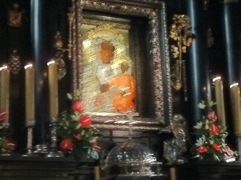 From Warsaw to the Black Madonna in Czestochowa (fantastic time). Mass, tour of the largest pilgrimage site in Poland. Sometimes over 1 million people in one day. Tradition says the icon of the Black Madonna was painted by St. Luke on a table made by Jesus. After this moving visit we drove to mountains if Zakepone where John Paul II vacationed throughout his life. Reminds me of Switzerland. Great day. I am not writing this to express any opinion but to provide information and various thoughts of others – at least at this point.